Connection base and spindle screws material: 100% Solid Premium Grade-304 which results in a very long durability and usage. Door Type: Mountable on all types of doors including but not limited to glass and wooden doors, works up to 3.2 inches door thickness. Note: Each purchase comes as a PAIR of door pulls for inside and outside of a single door. For double doors, 2 pairs are required. Drill and create two end to end holes between 0.315 - 0.600 inches (0.375 is recommended) on the door with a Center-to-Center Mounting Distance. Use the Hexagonal Allen wrench to lose the hex socket set screws in the top and bottom pull connection base, remove apart the inner side and outer side of the door pulls. Put the inner side pull handle and outer side pull handle aligning at each other and tighten the 4 pieces of the hex socket set screws in the top and bottom pull connection base. This completes the installation process. Warranty Description : Limited Lifetime Replacement Warranty. 1. Quality 1mm thick, high-endurance 304-grade stainless steel for rust, stain, and corrosion resistance, Durable Connection base and spindle screws leads for a very long durability and lifespan. 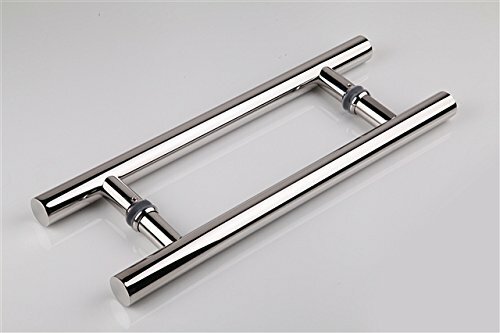 2.The ladder style round bar is finished in perfect smooth mirror polished chrome and has a length of 1500mm / 60 inches , hole to hole distance 1200mm/47.24inches , Cross-Section Diameter 32mm/1.26inches to fit most doors up to door thickness 2.36 inches. 3.All accessories (Allen wrench, spare set screws) included, very easy installation. 4. Each purchase comes as a PAIR of door pulls for inside and outside of a single door. For double doors, 2 pairs are required. 5. Applications: Entry/Entrance door handle, wood or glass door pulls, interior/exterior front doors, shops, shower bathroom, kitchen cabinets, gate, wine cellars, barn sliding door knob from small to large/big, please kindly note Togu door handles/pulls itself do NOT lock and is used in conjunction with deadbolts hardware and/or door catches.